With gift lists for everyone from teachers and coaches to family pet and the newspaper delivery person filling the blogosphere this month, I am joining the crowd and focusing this post (and the next) on the question: What’s a great gift for a mediator? It’s been some time since I last searched for mediator paraphernalia – t-shirts, mugs, bumper stickers, etc. with catchy mediator logos – so I was pleasantly surprised to discover the growth of this area over the past few years. I recall a time when I was lucky to be able to find “Mediators do it ’til everyone’s satisfied” bumper stickers to use as prizes in training courses. While I can imagine some limited circumstances in which such a slogan could be appropriate in a real mediation to encourage folks to consider options rather than bunker down to spend hours more at the process (e.g. in a commercial mediation with experienced participants and no worrisome power imbalance), it’s inspiring to see so many more options out there now. 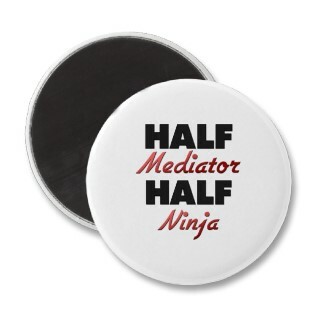 I hope that someone in my family considers the “Half Mediator, Half Ninja” button as a stocking stuffer. It’s clearly designed to encourage settlement discussions! And check out the rest of the options at zazzle.ca. Aside from the ninja mediator slogan, I am confident that quite a few of the possibilities could trigger a good “pattern interrupt” in a mediation session. “Trust me, I’m a mediator”, “Peace, Love, Mediation”, or “During the day, I dress up like a mediator” all offer a chance to lighten the mood and refocus. Picking up from my thoughts on bright socks as pattern interruptions back in January 2011, I can’t resist suggesting great mediator socks as the ideal stocking stuffer. 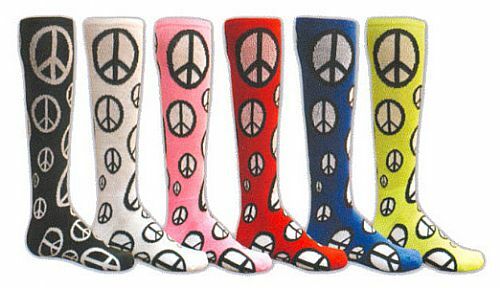 The brightly coloured peace socks at left can be purchased online at Panda Sock Store. Other terrific sock options are available at Sock it to Me. I’ll resist the ninja socks to go with my ninja pin, but consider the calfinated socks (at a great sale price!) as a statement about your endurance as a mediator. Or the Super Pig socks as a retort to the inevitable “when pigs fly” stalemates. Or perhaps “SuperMediator” socks? And do make sure that if you simply want to have tacky sweater socks as a seasonal conversation item that you order quickly. This is the first year I’ve succeeded in getting my order in before they ran out! Tea has an incredibly long history – across numerous cultures – as a drink associated with ritual, social gatherings, work parties, etc. The simple act of making and drinking tea together, then, can offer a break in a heated discussion and signify a positive commitment to resolving conflict. Beyond its potential symbolic or ritual messaging, modern research supports the common perception of tea’s soothing quality. Such herbal teas as lavender, chamomile, and passionflower have been recommended for years by herbalists for their calming qualities. Ashwaghanda tea (traditionally used in ayurvedic medicine) has been shown to inhibit neural activity and to produce effects in rats comparable to those of the anti-anxiety drug lorazepam. So, culturally and possibly even medicinally, tea makes sense as an item in the mediator’s toolbox. I’d like to suggest a few forms of tea that might also contribute potential for interrupting an impasse. A few outstanding choices from Davids Tea: Three Wishes and Fantasy Island offer scope for unrestricted brainstorming; Checkmate (“This tea isn’t like a chess game of black versus white, it’s black and white working together”); Happy Kombucha (“a golden ray of psychedelic sunshine”), and, of course, Secret Weapon to be pulled out at times of extreme impasse. 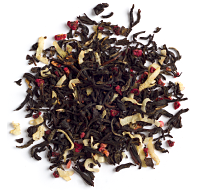 Teavana offers a range of relaxing teas including Relaxation Blend, Lavender Dreams, and Peach Tranquility Herbal Tea. That said, the mediator’s mindset is an important factor in the process, and research suggests that essential oils may well contribute to a sense of calm that may carry over from the mediator to the parties. With that in mind, perhaps the mediator who has everything would benefit from a Calm Essential Oil Blend of frankincense and orange? Or Lavender bath salts? Self-care is really part of the job, after all! Remember the romance of the mixtape? Well, it may not involve all the work of making the perfect cassette, but the fact that the personalized playlist is easier to create has just led to its broader application: it’s so easy to create a digital playlist of highly specialized mixes (e.g. a mediation mix, or a mediator’s mood setting mix, or a topical mix about workplace disputes) that it’s not just the lovesick teenager who has time to create one. What does your mediator like to listen to before a mediation? Are there songs s/he might play in a mediation? And while this is by no means a mediator specific suggestion, consider giving Love Is a Mix Tape: Life and Loss, One Song at a Time by Rob Sheffield as a complimentary, and tangible, item. A wonderful and deeply touching book that underlines the potential power of music to connect people. Gamers’ die (Just as Sheldon uses D&D dice to reach conclusions on all unimportant matters in the clip below, gamers’ dice offer options for resolving just about any dispute. Widely available and widely varied, they’re a fun option that also allow for the possibility of rolling for “ability scores” – e.g. player who rolls the highest “persuasion” or “charisma” points convinces the other). And you can accessorize your gamers’ dice with a great chain mail dice pouch! A gift certificate to purchase smartphone apps will be well received as a mediator gift if you also provide a list of suggestions of “apps for mediators”. I will publish a list of my favourite mediator apps in two weeks’ time (subscribe to this blog to receive an email when it comes out), but in the meantime, try a google search for negotiation apps or search negotiation, mediation, deal making, creativity, etc. in your App store and build your own list of suggestions. I’ve spoken in other contexts about my inadvertent discovery that the use of “cards” in a mediation can be remarkably effective, and it is based upon that experience that I recommend referee equipment of many sorts as mediator gifts. In my case, I had just completed my coursework for field hockey umpire certification the night before a Small Claims mediation and happened to arrive at the mediation with the green, yellow and red penalty cards used in that sport still in my backpack. Since I was mentoring two law students that day, I joked with them about using the cards in the mediation during our pre-mediation preparation session and left them out on a table behind us as the mediation itself started. No doubt purely because they were visible, I couldn’t resist trying them out when the parties got into a unproductive, blaming discussion about past behaviour. I brought them to the table and suggested that we should use them for ground rule infractions. I had to explain the green card (which at the time was purely a warning to all players about a specific type of infraction that was happening too often rather than a penalty to one player), but the group was definitely sports-minded and intrigued by the idea. So we identified the behaviours we would consider to be infractions and started up our discussion again. Almost immediately, I committed a foul (intentionally, I admit) and the parties gleefully insisted that my fellow mediators card me. From that point on, the parties were incredibly responsive to green cards being shown for such infractions of our mediation rules as rehashing past facts for the purpose of assigning blame, interrupting, etc. and they frequently carded themselves. Such a response is not going to be universal, but … if you referee a sport, are mediating in a sports-related context, and know that your parties (and counsel) are interested in sports (which is often obvious when you are first grouping and the entire room is discussing a game from the evening before), penalty cards are a viable tool to add to your toolbox. Buffoonery Workshops Buffoonery workshops are about “getting out of your head and away from that inner critic”. Not just for actors, buffoonery workshops address wellness, spontaneity, and team-building. Give yourself or a mediator you know a real “jolt” and sign up for a buffoonery workshop for 2013. Theatre for Living workshops We are fortunate to have a wonderful local theatre company (Headlines Theatre) offering annual training in a theatre form derived from Augusto Boal’s Theatre of the Oppressed. Learn about this process for community dialogue and the tools of the “joker” whose role in many ways mirrors the mediator’s own. Or get away for a week to really immerse yourself in a different form of dialogue and consider the Theatre of the Oppressed Training at the Mandala Centre in Port Townsend, WA. I’m hoping to find a workshop on Metta Bhavana to build on the introduction to “the conscious projection of goodwill” as a tool in mediation that I gained from Martin Golder last year. A quick search shows numerous local possibilities and I welcome recommendations! On the less expensive side of things (and reflecting the fundamental purpose of this blog), don’t forget that a $50 membership in CoRe Conflict Resolution Society entitles a member to attend all 8 CoRe Clinic Speaker Series events for 2013. You can purchase a membership or gift membership online at http://faculty.law.ubc.ca/coreclinic/Membership.html. If you’re purchasing a gift membership, be sure to include the member’s name and email information in the notes section once you have entered Paypal. Or email coreclinic1@gmail.com to confirm the membership information. If you read my last post, you will be entirely unsurprised to discover that my #1 mediator gift this year is a Bot. I love my Bots and may just be giving them to everyone I know this year – mediators, family members, random strangers! Check out Gary Hirsch’s wonderful and flexible Bots at his Etsy shop and consider giving your favourite mediator a whole set of mediation Bots: Listening, Brave, Inspiration, Decision, Zen, Time and the all important Yes Bot. This is a fantastic list Sharon. Dare I say that this would platform into a very cool ADR curriculum/ course! And may I suggest you augment it with some personalized M&M’s from mymms.com … maybe in the form of a jar of m&m’s, each with a different message (impasse breakers of course) imprinted?